Tax Day may not be anyone’s favorite holiday, but it does come with one big perk: Tax Day deals! And there are plenty of food and drink discounts available on April 15 to fuel you until next season. Scroll through and see if any of your local spots made the list. BurgerFi: Download the BurgerFi app to benefit from $4.15 double cheeseburgers on Monday the 15th only. Note that the offer is only available in-app, and premium toppings will cost you a little extra (hopefully you get that tax break)! Potbelly Sandwich Shop: To celebrate the end of the much-maligned season, Potbelly will be offering a Buy One Sandwich, Get One Free (of equal or lesser value) all day long on April 15. Potbelly Perks loyalty members can use their account to get the deal, and those without it can simply mention “tax day” to the cashier when they’re checking out. Schlotzsky’s: More free sandwiches! On April 15 only, guests can claim one free small The Original sandwich with the purchase of a medium-sized drink and chips. Available at all Schlotsky’s locations nationwide. BJ’s Restaurant & Brewhouse: Whether you’re dining in, taking out or ordering delivery from BJ’s on April 15, you can score a deal of half off large deep dish or tavern-cut pizzas. Tax Day also kicks off three weeks of free delivery and no service fee on delivery orders on the BJ’s website! Hardee’s: Start Tax Day early and head to a participating Hardee’s location between 7am and 10am for one free Made From Scratch Sausage biscuit. Just mention the phrase “Made From Scratch,” while supplies last. B.GOOD: If you don’t already have the new B.GOOD app, get going! On April 15, you’ll get your choice of a free green bowl, grain bowl or burger simply for downloading. If you already have the app, don’t worry—you’ll still get rewarded with free fries with any purchase. Valid at participating B.GOOD locations. ezCater: Catering to both taxpayers and the accountants sprinting to the Tax Day finish line, ezCater is giving new customers $50 off all weekday orders through April 17. Simply use the code ezTaxes2019 at checkout! 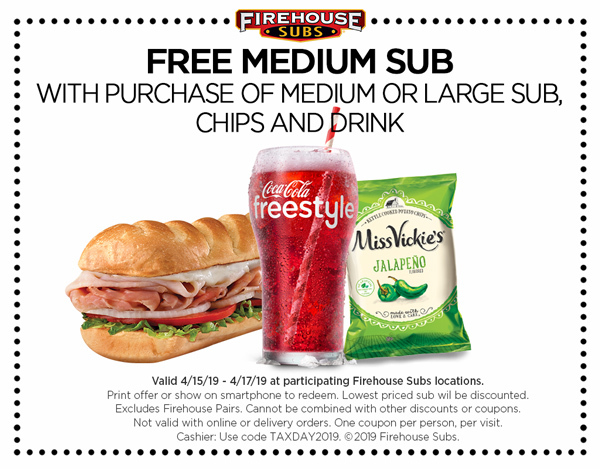 Firehouse Subs: Stop by a Firehouse Subs location between Monday April 15 and Wednesday April 17 to score a medium sub when you purchase a full price medium or large sub, chips and a drink. Simply show this coupon—either printed or on your phone—at checkout. 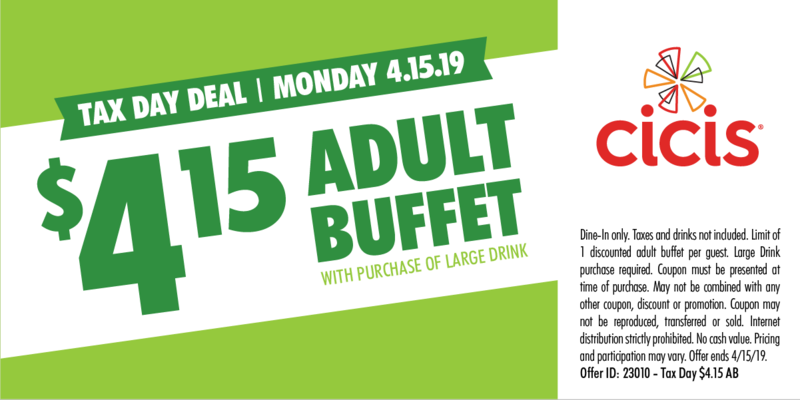 Cicis: Eat the tax pain away with a discount on the Adult Buffet. Eat your heart out for only $4.15 with the purchase of large drink, just show this coupon. Smoothie King: Refresh yourself post-tax stress with $2 off any 20-ounce smoothie at Smoothie King. Deal is available through the Healthy Rewards app, from April 15th through 18th.